About 600 civil-rights marchers made their way across Route 80, in Selma, on the 7th of March, 1965. It was a Sunday and the non-violent demonstrators were planning to march about 50 miles to Montgomery—Alabama's capital city—to protest the shooting of a young black man—Jimmie Lee Jackson—by a white state trooper and to agitate for voters' rights. Jackson, a Vietnam-War veteran, had been shot in Marion, Alabama on February 18th. He died eight days later. At the time, Selma not only had a very poor record of registering African-Americans to vote, the city had seen violence when (among other events) Annie Lee Cooper (who was waiting in a long line on voter-registration day) had challenged Sheriff Jim Clark (on January 25, 1965). Dr. Martin Luther King, Jr., who believed that African-Americans in the South would only get the vote if the federal government passed laws to make it happen, wanted to start a campaign raising national awareness about black disenfranchisement. 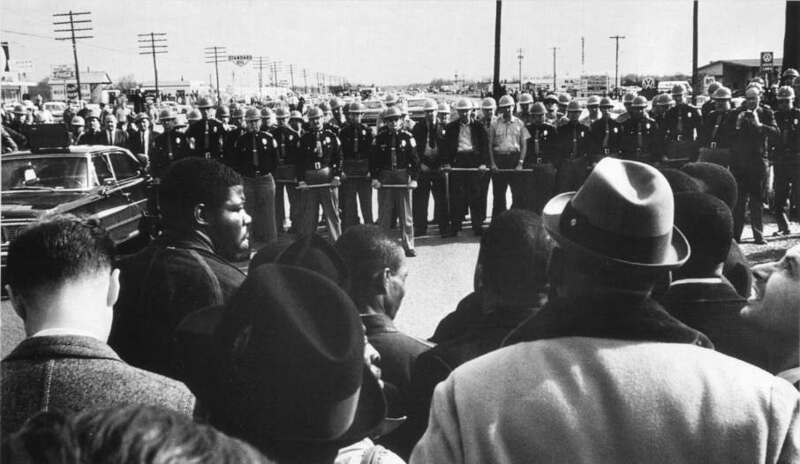 When the marchers reached Selma's Edmund Pettus Bridge—about six blocks from their starting point—they were greeted by a line of lawmen who refused to let them pass. Instead of turning-back the demonstrators, police officers—using billy clubs and tear gas—attacked them. The event, forever after associated with Sheriff Clark, became known as "Bloody Sunday." Two days later, on the 9th of March, protestors tried to walk to Montgomery again. This time they were led by Dr. King. Once again, as they made their way along Route 80, the peaceful marchers were met by waiting lawmen. They knelt to pray, sang "We Shall Overcome," then turned around and left the bridge without crossing it. Thereafter, the event has been known as "Turnaround Tuesday." On the evening of "Turnaround Tuesday," three white pastors—James Reeb, Clark Olsen and Orloff Miller—had dinner together in Selma. 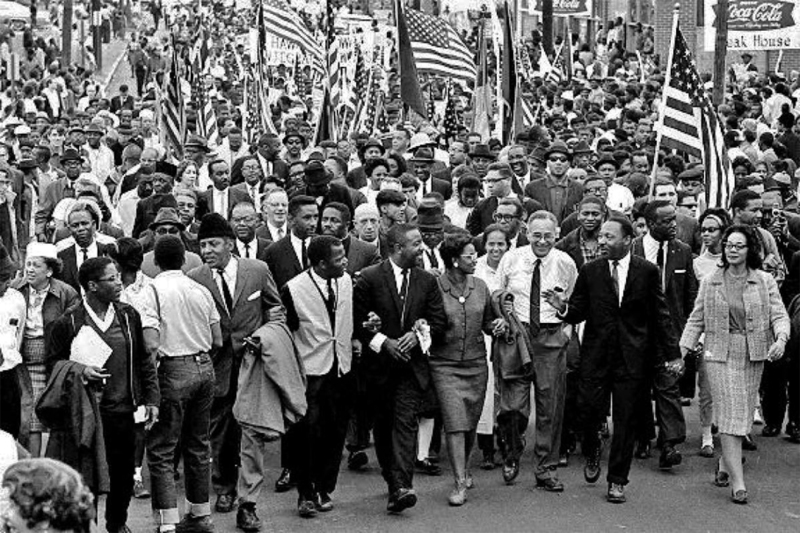 They'd responded to Dr. King's call to march in solidarity with the people of Selma. After leaving the restaurant, the three pastors followed the shortest route back to Brown A.M.E. Chapel (where everyone was gathering). Without knowing it, they were heading past a local bar which town whites patronized. As Reeb, Olsen and Miller approached the street corner, three men came across the street shouting at them. The pastors were stunned to see several white men making their way toward them, in a hostile manner. One man was carrying a heavy wooden club. After a vicious attack, Rev. Reeb was fatally wounded. He died two days later. It wasn't the first time Jackie (who'd refused to give-up his seat on a bus during his military days) had telegraphed a sitting President. 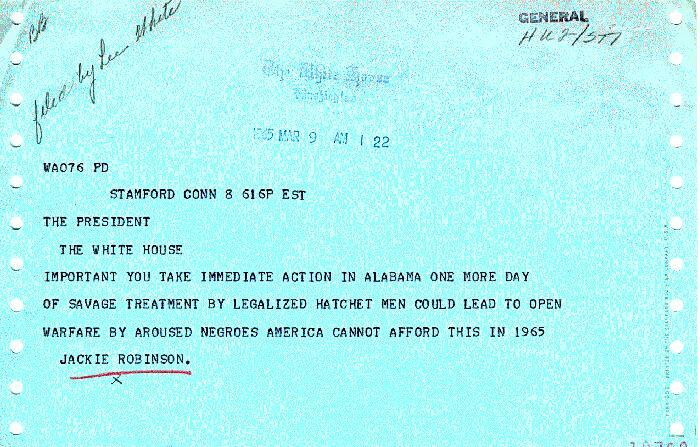 It also wasn’t the first time the currently sitting President—Lyndon Baines Johnson—pondered what to do about civil rights in America. By the time of the Selma March, Johnson had been elected President in his own right (after filling the remainder of President Kennedy’s term, beginning on November 22, 1963). During the election year, of 1964, the events of "Freedom Summer" confirmed how far afield America was from voters of all color participating in the election process. Realizing that he had to work with Dr. King on civil-rights issues, LBJ—as the President was often called—met with MLK in December of 1964 (as he had, the prior year, on December 3, 1963 as shown in this photo by Yoichi Okamoto). Among other things, the two men discussed the need to pass a Voting Rights Bill at the national level. Too many African-Americans were being disenfranchised because of voter-registration restrictions in various states. The Civil Rights Act of 1964, which became law not long before the two leaders met in December, gave the President some legal tools he could use to address voter-registration unfairness. One of the President’s ideas was to allow African-Americans to register at post offices (operated by federal, not state, employees). In early January, of 1965, LBJ brought his ideas to the American people. During his State of the Union Address—at 25:26 into his speech—he vowed that his administration would do whatever was needed to finally get rid of obstacles standing in the way of every American's right to vote. Taking action within the Justice Department, LBJ directed his team to craft a constitutional amendment banning anything which interfered with a person’s ability to register as a voter in his/her state. He also had his team work on legislation which would permit the federal government to register potential voters. Later in January, the President and Dr. King talked by phone. 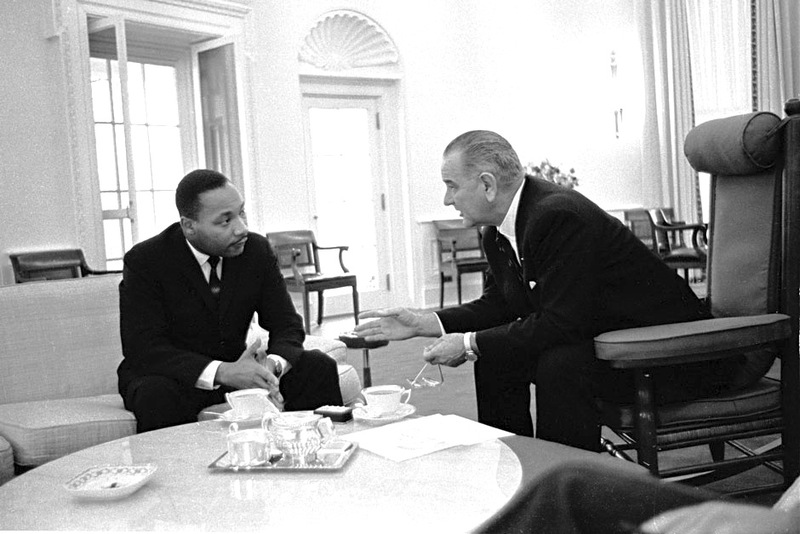 During their lengthy discussion on the 15th, which we can hear, LBJ encouraged MLK to help him with the legislative process by positively discussing voting-rights legislation. On the 9th of February, King (who wanted to move the voting-rights process forward quickly) and Johnson (who thought that moving too quickly might result in Congress turning-down a bill) had a fifteen-minute meeting in Washington. The President urged King to tell journalists about a forthcoming bill which would correct the voter-registration problems. The next day, American newspapers reported not only that fact but gave more specifics (like the need to end literacy tests as a prerequisite to voter registration). Although King and Johnson did not always see eye-to-eye on approaching and resolving the voter-registration problem, they tried to work together to end the unfairness. And ... there is evidence that the President was very concerned about J. Edgar Hoover’s efforts, as head of the FBI, to discredit Dr. King. What were those FBI efforts? Among other things, on November 8, 1964—less than a month before King accepted the Nobel Peace Prize in Oslo—Hoover had publicly called Dr. King "the most notorious liar in America." Dr. King was also very aware of the FBI's less-public efforts to discredit him, and so was Coretta Scott King (his wife). Despite the incredible tension of the time, King pushed the movement forward with his actions and words. Sometimes he'd call his friend Mahalia ("Halie") Jackson, the famous gospel singer, who would sing to him over the phone. One of the songs she'd sing was "Precious Lord, Take My Hand" (which Jackson also sang at King's funeral). The Selma March - which Americans witnessed on their televisions— fueled the idea that a federal law was needed to protect African-Americans who registered to vote. One week after the March, LBJ addressed the nation via a televised speech to a joint session of Congress. There is no constitutional issue here. The command of the Constitution is plain. There is no moral issue. It is wrong, deadly wrong, to deny any of your fellow Americans the right to vote in this country. By the summer of 1965, the bill had enough votes to pass in both the House and the Senate. 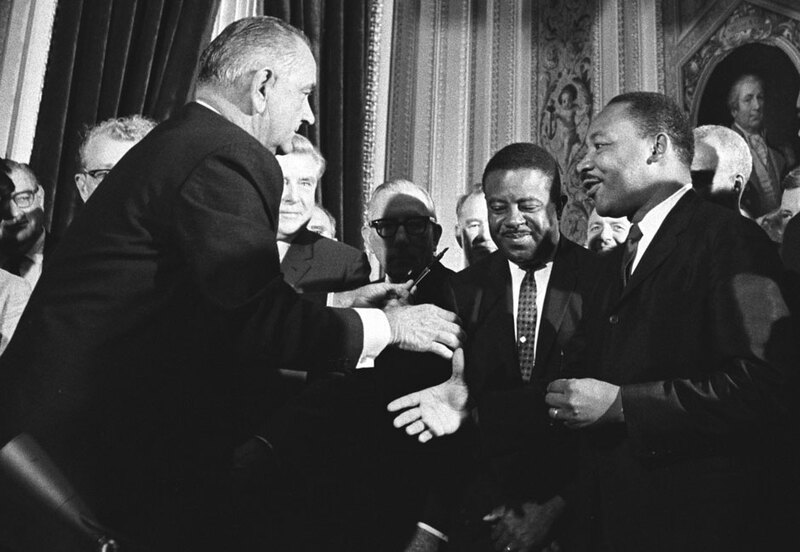 Dr. King was on hand when the President signed the Voting Rights Act. ...a triumph for freedom as huge as any victory that has ever been won on any battlefield. It was also a personal “triumph” for Dr. King. Yoichi Okamoto took this photo of the President with Dr. King, at the Capitol, after LBJ signed the Voting Rights Act on the 6th of August. The idea of a march from Selma to Montgomery was, itself, a personal triumph for Dr. King, especially when he was able to announce, to a gathered crowd, that Judge Frank Johnson had issued an order allowing it. No longer—after that federal-court-order—could anyone declare that the march was an unlawful gathering. To be sure the people were safe, en route, President Johnson federalized the Alabama National Guard. On the first day of the now-authorized 54-mile march, around 3200 people gathered. They—like Dr. King—believed that “345 years” of slavery and segregation was “too long” to wait for more progress in racial equality. This AP photo depicts a scene on March 21st as Dr. King and Rev. Ralph Abernathy led the crowd. By the time the Selma-to-Montgomery marchers were in their fifth day of walking, their ranks had swelled to 25,000 people. The events in Selma, during March of 1965, are featured in the film "Selma," released in 2014 and starring David Oyelowo (pronounced oh-YELL-oh-oh) in the role of Dr. King. The video clip, at the top of this page, is a compilation of historical footage depicting the events of March 7 ("Bloody Sunday"), March 9 ("Turnaround Tuesday") and March 21 (the day Judge Frank M. Johnson, Jr. issued an order allowing the march to continue). Compilation of historical footage, by Universal Newsreels, online courtesy U.S. National Archives. Bos, Carole "Selma-to-Montgomery: Bloody Sunday" AwesomeStories.com. Jul 01, 2014. Apr 26, 2019.